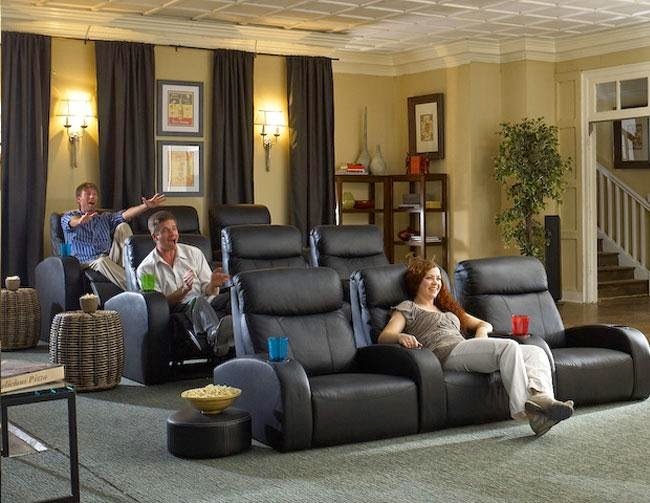 DEDICATE A ROOM FOR HOME THEATER AND ENJOY THE MOVIE THEATER EXPERIENCE! Getting a big screen picture is the first start to enjoying a movie-like experience at home, but don’t limit yourself to this alone. 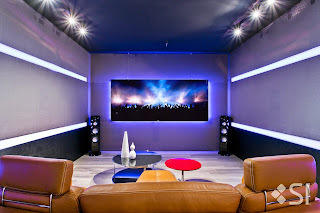 Picking a room of your home to become a “dedicated” home theater is the best way to acknowledging that you want your entertainment to be as exciting and dynamic as possible when sitting down to watch. This is also when it makes sense to turn to professionals who can help you realize this goal, for example, the professionals at JUST ONE TOUCH. 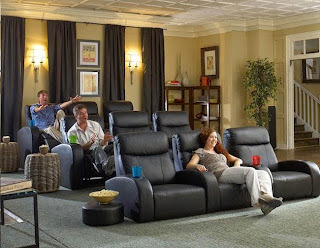 Think of them as architects who work with home theater equipment and the physical space the equipment will be occupying — so as to create the perfect environment for you and your family. The size of the video display depends primarily on whether there will be a flat-panel of a front projection system. Flat-panels can be mounted to a wall or placed on a cabinet, with their physical size stopping at 85” in general. 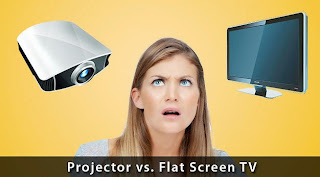 A front projection system typically begins at 100” but requires space for the screen to go on the wall and also space between the screen and the projector (this “dead space” occurs whether the projector is mounted to the ceiling or placed on a stand on the floor or on a rear wall). The days of just having stereo are long gone, and so now there is multi-directional audio coming from multiple speakers placed throughout the room. Most recently new audio systems have become available that crate an even wider sound field that can totally encompass the listener and doesn’t require being in the “sweet spot” only (making things a lot better for other people looking to enjoy the sound too). So speakers can be found in the ceilings as well as on the walls and/or on free-standing speaker stands situated throughout the room. A subwoofer is also critical in order to get the deep bass that makes everything sound more realistic. Its placement can be adjusted based on the overall room’s design, but must be done so with a careful eye so that it can perform in an omnidirectional pattern. There will also need to be an amplifier with enough power and “smarts” to control the sound being sent to the speakers will also add in other features, such as being able to stream music locally as well as having Internet capabilities. 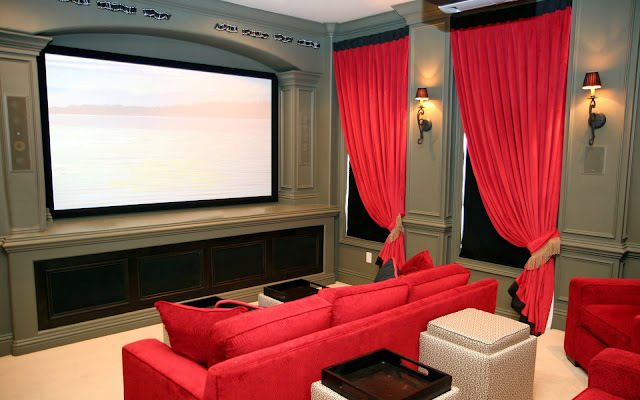 The various components that comprise a home theater don’t need to be in the room, but they do need to be hooked up to the video and audio in the room. Their placement needs to be accounted for as that will add to the room’s decor (if kept within the room) or as to how they are to be accessed and used when it’s time to watch. Placing the equipment on racks or in cabinets or otherwise will need to be decided on as part of the overall room’s design. Should the wires and cables running to/from the equipment cause too many problems, there are ways to ‘hide” them (running through walls for example) or even eliminate their use through wireless technologies. Making the room both visually and aurally correct requires some physical modification. Light sources, such as windows and around doors must be blocked efficiently without eliminating their use at other times. The room’s sound — its acoustics — must be manipulated so that audio performs effectively. This could require sound proofing of walls, for example, or of the speakers as they contact the speaker stands or the floor or wall or ceiling they are found at. Lighting is also something that must be accounted for — especially if the room isn’t to be used in a totally darkened state — so that no one is stumbling about when moving during showtime. Professionals can program the lights to perform in a manner that compliment the video being displayed, be that having all the lights go out or a certain level of illumination remaining. Those watching need to be comfortably seated so that all the hard work at creating a dedicated theater isn’t a chore when the lights go out. What kind of seats will work best for what number of people? These are things to work out so that every time you watch, it’s an enjoyable experience. As can be seen, all of the above require careful planning and even more careful execution. 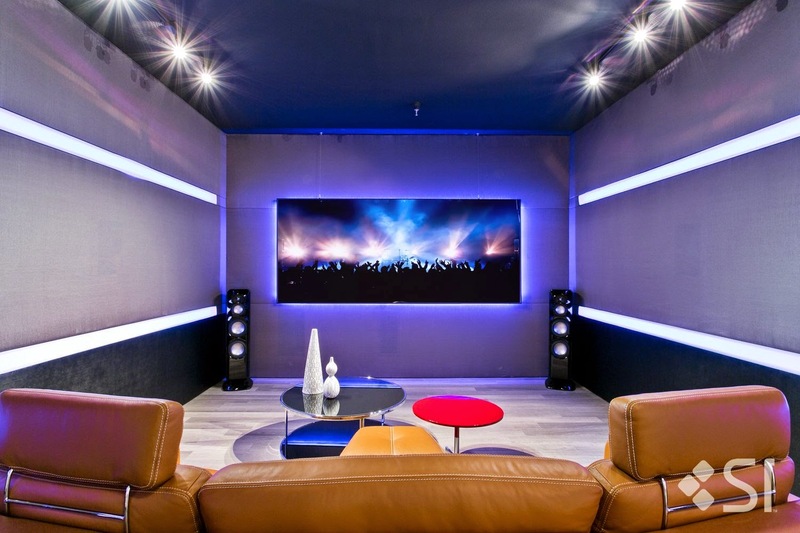 Professional installers like those found at JUST ONETOUCH can help you realize your goal of a home theater that’s not just worthy of the name, but a way to enter realms that make boring reality seem galaxies and light-years away.